LAHORE: (Tuesday, November 20, 2018): Punjab Minister for School Education Dr Murad Raas has said that the government would ensure children’s access and retention at schools and the experiment of afternoon classes would meet success. He said that quality education would be imparted to children through teachers training program and appointment of teachers on merit. 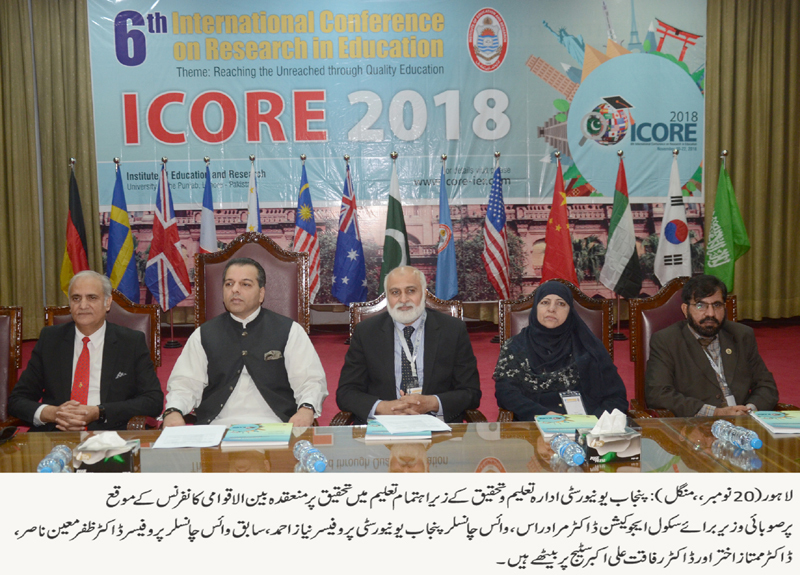 He was addressing the inaugural ceremony of 6th International Conference on Research in Education organized by Punjab University Institute of Education and Research at Faisal Auditorium here on Tuesday. Former PU Vice Chancellor Prof Dr Zaffar Mueen Nasar, PU VC Prof Niaz Ahmad, Dean Faculty of Education Prof Dr Mumtaz Akhtar, Institute of Education and Research Director Prof Dr Rifaqat Ali Akbar, Department of Secondary Education Chairman Prof Dr Abid Hussain Chaudhry, Conference Secretary Dr Shahid Farooq, Dr Abdul Abdul Qayyum Chaudhry, renowned scholars from USA, UK, UAE, KSA, Germany, South Korea, Sweden, Thailand, Malaysia, Australia, Mauritius, New Zealand and various parts of Pakistan while a large number of students participated in the conference. Addressing the ceremony, Dr Murad Raas said that we must teach our children in our own language in order to create critical thinking among their minds and for better comprehension of the subjects. He said that the medium of instruction from grade one to grade five would be Urdu language at schools while English language would be taught as subject. He sought guidance and support of all stakeholders in this regard. He said that in the next 90 days, the data bank of all the departments related to school education would be established and all the departments would be integrated to help each other. He said that the government was introducing new reforms in education sector. He urged the IER students to teach children at schools for one year as they would be the best teachers and country’s future was in their hands. Former PU VC Dr Zaffar Moeen Nasir said that the incumbent Punjab government was making serious efforts to improve quality of education in Punjab. PU VC Prof Niaz Ahmad said that quality teachers and curriculum developed on modern lines played important role in quality education. He said that academic programs also must be accredited by relevant accreditation councils for their quality. He said that the basic purpose of institutions of higher learning was creation of new knowledge, knowledge transfer and inculcation of high moral values to the students. He said that the institutions that did not pay attention to quality were replaced by others. He said that unemployment was the biggest problem being faced by higher education sector and the culture of entrepreneurship must be introduced to cope with this issue. 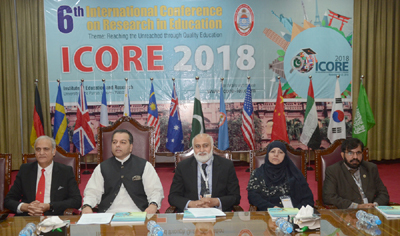 He urged the conference participants to present recommendations for improvement of education sector in Pakistan so that PU could play its role in development of country and the nation. Dr Rifaqat Ali Akbar said that around 255 research papers would be presented in the conference and the conference would provide the best opportunity to learn from each others’ experience and research. Various sessions of the conference would continue till Thursday.